As a New Jersey kid going to college in Iowa in the very early 1960s I often took the train. My favorite ride was through LaSalle Street Station in Chicago, which I reached via the New York Central's 20th Century Ltd - Commodore Vanderbilt from Grand Central in New York, on which a car would be reserved for kids froom my college. From there we would hop a Rock Island Lines train and travel to school in some style. In 1983 I returned to LaSalle Street Station and found but the skeleton of the old terminal. Gone was the entire waiting room and its restaurants, replaced by a barren staircase to the street. Gone, too, were long distance trains, with old Central runs pretty well stripped by Penn Central and then turned over to Amtrak and routed out of Union Station. Here's what was left, a Rock Island commuter to western suburbs. I had befriended a conductor on the westbound California Zephyr on a trip back in 1968. Hanging about with trusty Nikkormat in hand day and night I welcomed his pointers to good photo ops. It's hard to beat this one of the eastbound CZ somewhere on the Western Pacific in California. We went in the hole and he sent me to the dutch door. "Don't lean out too far sonny. But get ready for #18. And wave to the engineer." It's not that today's Amtrak staff don't love trains or help customers, but in those days when insurance policies might have been less staggering in cost and significance there were always folks hanging out of dutch doors like me -- and now and then conductors to help. And, wouldn't it be nice if Amtrak could name individual cars -- 'Silver Plume', 'Silver Planet' and some of the other wonderful names which gave the old CZ a dose of its romance? If my notes serve me correctly this photograph of Amtrak's pre-Superliner Southwest Chief was taken in Las Vegas, New Mexico, in the late Spring of 1973, on its run from Los Angeles to Chicago. I do remember that very shortly before the picture was taken the Santa Fe forbade Amtrak from continuing to use 'The Super Chief' as the official name of the train. The reason given was that Amtrak was unable to maintain the quality associated with Santa Fe's premier varnish. 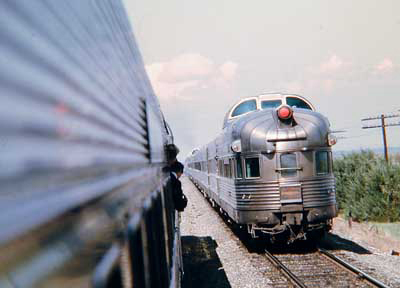 For those readers not familiar with the Super Chief in its last Santa Fe days it was an all low-level sleeper section of the train shared with El Capitan highly favored by Hollywood and media celebrities, many of whom began their travels in New York on the Central's Twentieth Century Limited. Both Santa Fe trains were extra-fare [somewhere in the vicinity of $8] and the Super Chief also featured the Turquoise Room-Pleasure Dome Lounge car, which contained a private dining room, as well as a standard dining car. The El Cap had its own high-level coaches, dining car and lounge car. All in all, an array of equipment and services hard for resource-poor Amtrak to maintain. Here's the New Haven, Connecticut, station on a quiet Sunday, November 18, 1998. When we arrived -- about 10:00 in the morning -- the parking was easy, the station spotless, and the Dunkin Donuts and newstand busy. An utterly pleasant experience. We were there to meet friends from England, who, having departed from Grand Central, were stunned by the beautiful restorations there and in New Haven. Our only complaint was an arrivals board that inaccurately announced the Grand Central train as 'arrived' ten minutes before it reached the station -- scaring us into thinking our friends had missed it. Later that day we dropped them off at Hartford for the Amtrak return to New York. Alas, the story there is less happy, with Hartford's restored station showing signs of neglect and failed dreams for use of its public space -- an apt reminder of Hartford's 'pre-New England Patriots' decline. For the photographers who are looking at this picture, you may be interested to know that it was taken, handheld, with a small Epson 550 digital camera, and that no adjustments, save reduction in size, were made to it.